Mosquitoes are extremely annoying creatures and potentially dangerous, too, especially when you take into consideration that it does carry around parasites and other kinds of diseases which could even kill given the right circumstances. Other than the mosquito, another irritating insect that should not have gotten on board Noah’s Ark would have been the fly. Flies are pesky insects, where they are so filthy and yet boast of this strange extra sensory perception that makes them difficult to kill. It is always a pleasant test of your reflexes if you want to knock down some flies, so what better way to do so than with the $13 Fly Sword Swatter? 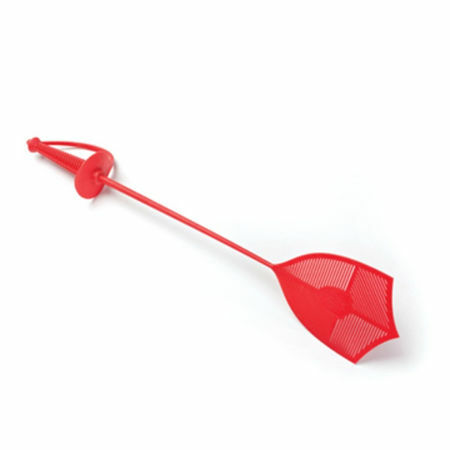 It boasts of a handle that resembles that of a sword, while the actual swatter bit looks like a shield.